15 months have passed since we set the sails from France for this sailing trip around the world. It brought us from encounters to discoveries thought the currents and tides of the english channel, on the remote islands of the Atlantic ocean and to the heart of the majestic African continent. This endeavour is clearly reaching our expectations. The motto that supports Apprentis Nomades’s vision keeps on pulling us ahead. Get amazed, Find your way, Inspire others. Day after day we learn more about the world and about ourselves. We wish to share those discoveries with you, the very treasure of this adventure. On a stopover in Madagascar for 4 months already, we have discovered the wonders of an amazing nature in Nosy Be region and the warmth of Sacalava people enchanting culture. Every passing day surpasses the other. The navigation among the islands is magical, the walks in the forest are powerful, the primal contact with animals leaves speechless, the dances on the dust are wild and the encounters are full of sense. This stopover made us want to write. About the Apprentis Nomades adventure and the learnings of a whole new life but also about the everyday adventures through short articles like this one. On the Malagasy coast line, around Nosy Be stand plenty of bays. Sprawling sea arms digging in a thick mangrove mantel. The bio diversity of these areas is spectacular and it is no coincidence if the fishermen’s villages settled there. It is literally teeming with fishes. From dusk till dawn we witness the chase of small fishes by the big ones. A sea life far away from being relaxing. This week we throw the anchor in Baramahamaya, 40 nautical miles South of Nosy Be. In this estuary, it seems like time has stopped. The villages made of mangrove wood huts live on fishing and wild honey harvest they sell in Nosy Be. Barter with the visitors is common here. A few fishing hooks and lines were enough to get 3 big mangrove crabs for dinner. The day after we walked through the red earth trails cut in by a machete. The humid heat forces us to have breaks under the huge mango trees running alongside the trails. The sight on the bay is stunning and we hardly believe there is an international airport not even a 100 kilometer from here. 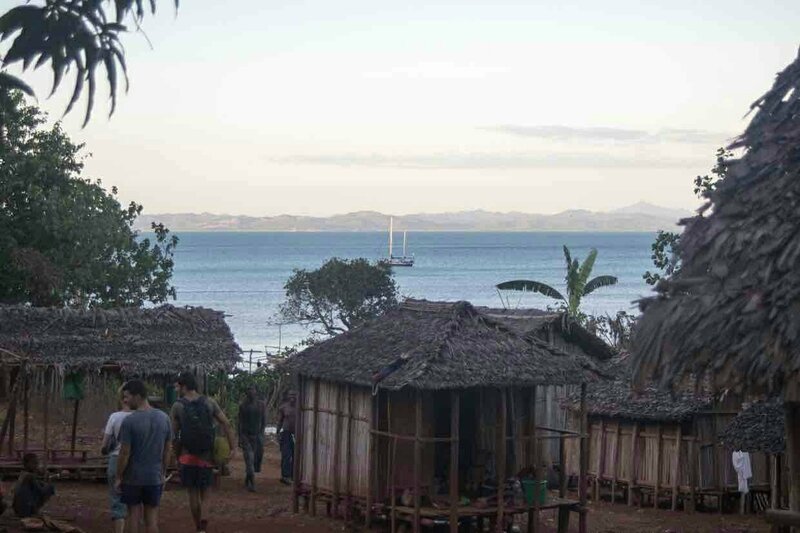 We only stayed 4 days in Baramamai, a very special village called Antintorona was waiting for us on the vigorous Nosy Komba island. This is then an introduction to a new section that will appear 2 to 3 times a month on www.apprentisnomades.org and our facebook page. The notes of the « Apprentices ».